York, PA Custom Wedding Cake, White and Blue Draping Fondant Cake! 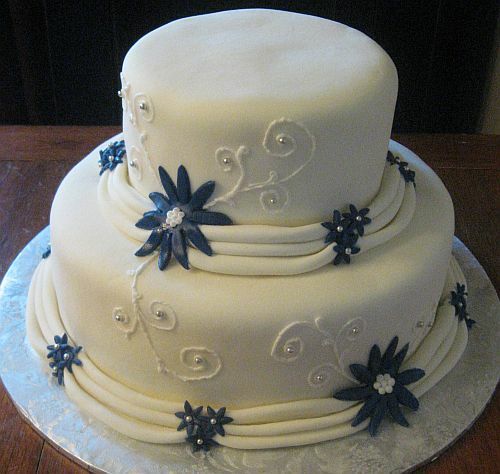 White Wedding Cake with Blue Flower Accents and Draping Fondant! I am so impressed that I actually have the time to post this Wedding Cake today! Why? Well we usually never get to post anything the day it is made and usually it takes us a week or two to get it on our Baking Blog! Impressive I know 🙂 This Wedding Cake is for a Wedding tomorrow afternoon. The request was that we make a small Wedding Cake to feed around 30 people. The colors were to be mostly white with Dark Blue accents. Everything else left up to me! Why do I love these cakes? The design is completely free from my head, with a little help from my sister 😉 I get to thinking and usually I am on point with our cakes. Not so much with this one however. It turned out to look nothing like what I was envisioning. My sister and I pushed ourselves to step out of our comfort zone and try something different with this Wedding Cake. 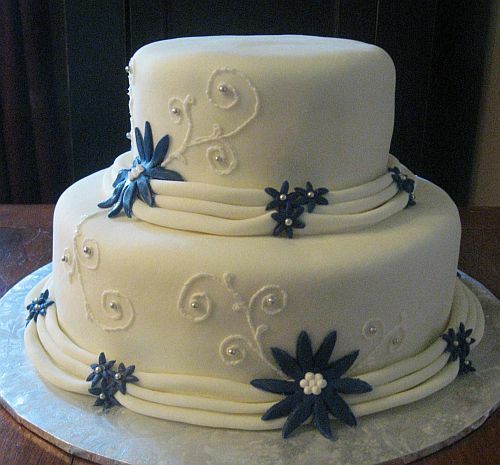 Originally we were going to do an elegant white fondant covered Wedding Cake, which we did, with a subtle dark blue piping of some kind and vine detailing. Boy were we way off. We ended up trying out a Fondant Draping technique to push us over to a new level, and somehow it worked!?!? I know, I know, once again we have proved ourselves capable of tackling another unknown challenge. Don’t think this Wedding Cake technique came easy. This paticular Wedding Cake ended up taking us alot longer than we planned. We had our ideas of how it should be done. I am sure you all know how that story goes, so to make it short, we figured out a trick to help it go alot smoother. We still weren’t out of the clear. No, we had to figure out how to make the Cake pop with some kind of dark blue detailing. This is where the Daisies come in. Afterall it is Spring and they are a great spring flower! So we added the daisies 2 large and about 33 small flowers. 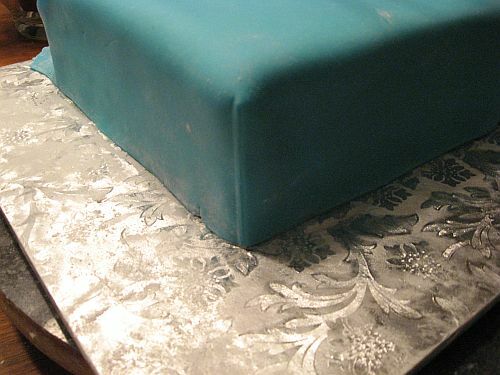 The little Silver Dragees were added to finish the accenting on the cake. A little white swirling and the finished product turned out to be very Elegant! 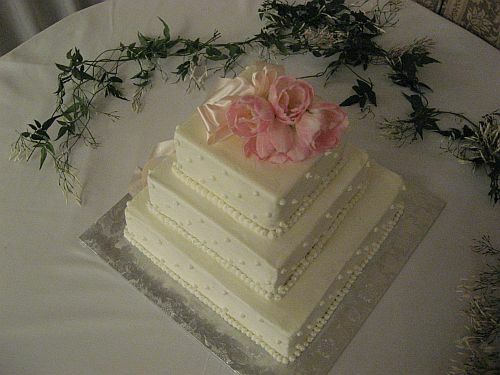 To view more Wedding Cakes by Bear Heart Baking Company visit our Wedding Cakes Page! Notre Dame Football Birthday Cake! 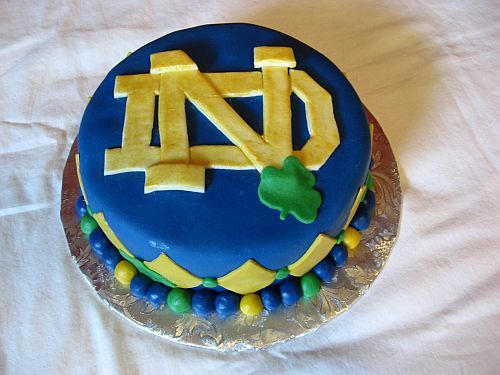 Notre Dame Fan Birthday Cake! We made this cake yesterday for a husband’s birthday. He went to Notre Dame and is obviously still a huge fan 🙂 She found us on the internet and gave us a call requesting a smaller cake with fondant for his Birthday. We joked around about not being able to make the cake because we are Penn State Fans. We both got a laugh out of that. The cake pick up went well and we hope they loved the cake!! 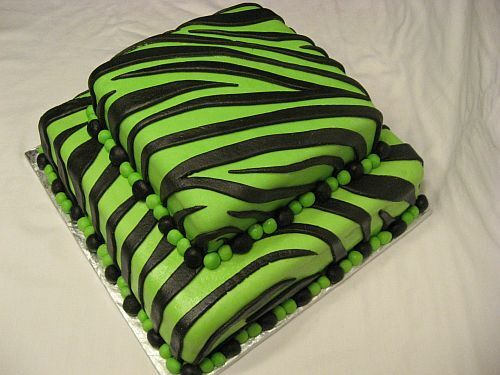 Neon Green and Black Zebra Striped Two Tier Cake for Bridal Shower! 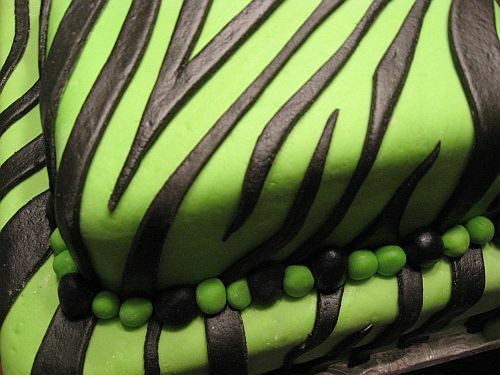 Neon Green and Black Striped Bridal Shower Cake! This cake was two tiers of our Red Panda Cake which is our Moist Red Velvet Cake with Cream Cheese Icing! The bride to be loves Neon Green and Zebra’s so it was combined to make this cake for her Bridal Shower. The cake was defintely any Zebra Striped lovers Dream. You can also check out our Pink and Black Zebra Striped Birthday Cake here. Elmo and Cookie Monster Cookie Birthday Cake! Elmo and Cookie Monster Cake! 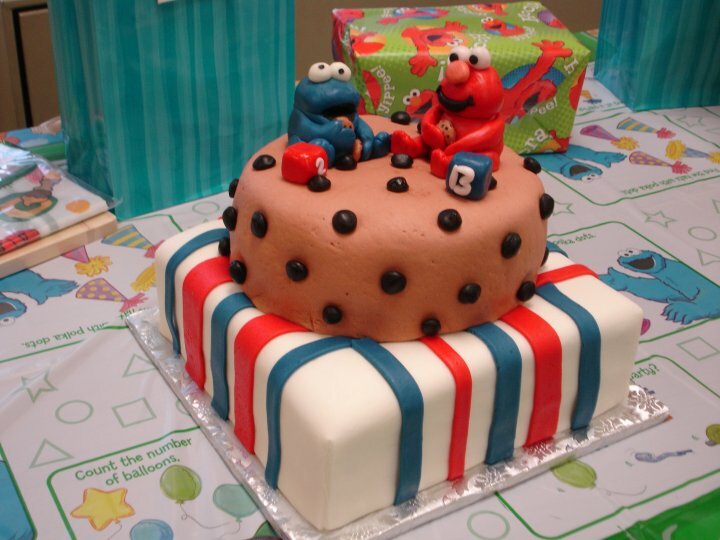 This Elmo and Cookie Monster inspired Birthday Cake was a combination of the two characters! The big Cookie Tier being the best part of course. The Elmo and Cookie Monster Characters were hand molded out of marshmallow fondant and the placed on the top of the cookie tier. The blocks have a 2 and a “B” for Bryce. It was a 2nd birthday party and the decorations complimented the cake so well! I heard the peanut butter icing was a huge hit! A square bottom tier and round top tier was also something new for us. I think it turned out great! Perfect Elmo and Cookie Monster Cake for a 2 Year old’s Birthday Party! If you take notice poor Elmo is clinging to his Cookie. Cookie Monster is gobbling two cookies! Something he does best! At Bear Heart BAking Company we love making Cupcakes! They are such cute little expressions of art. With everyone we make we are either expressing our creativity or on of our customers. 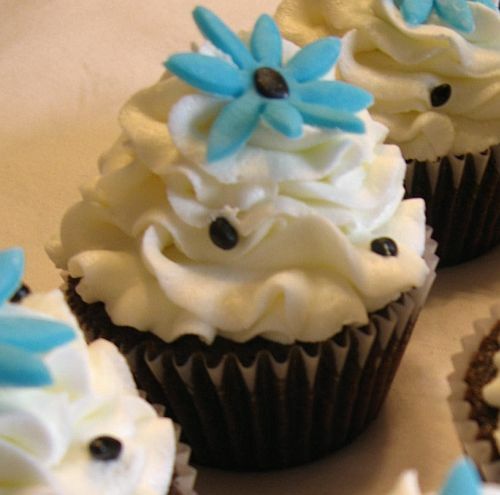 Whether it is for a Wedding, a Birthday Party, or even a Baby Shower Cupcakes are the perfect pairing for any event. These cupcakes were something that was inspired slightly by our Black and White Cake we recently made for a Sweet 16 Birthday Party! There was a hint of blue added to the custom cake and it looked great. So I figured I would try the color scheme with Cupcakes and it turned out great! 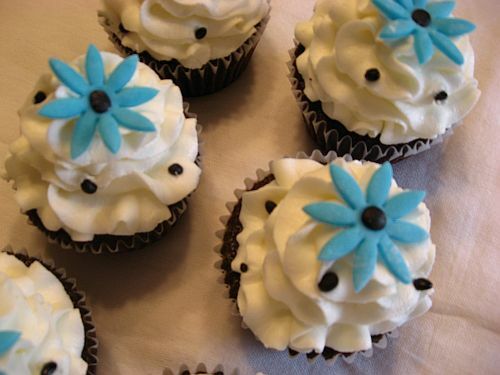 Black and White Cupcakes with Blue Daisies! 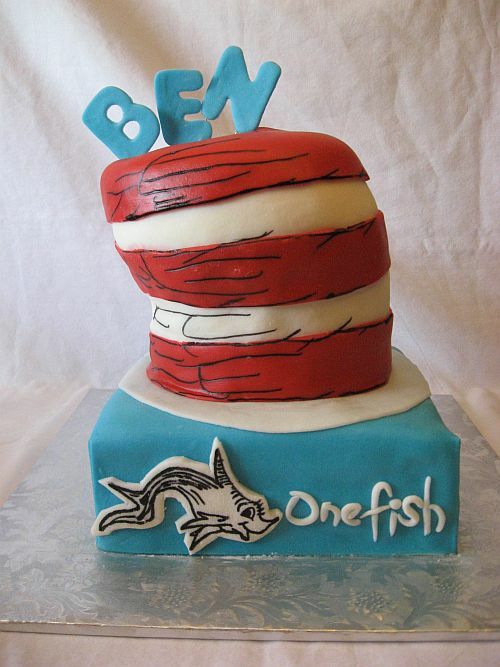 How to make a Cat in the Hat Dr. Seuss Birthday Cake with Fondant! We don’t usually post a step by step how to instruction post on making cakes but this one was just too fun! We figured we would share how we made it for anyone who was curious about how or even someone adventurous enough to attempt it themselves. The Cat in the Hat and One Fish, Two fish, Red Fish, Blue Fish are right up there with some of my favorite Dr. Seuss Books Ever. Next to Hop on Pop, of course! So you can imagine how extremely excited I was when I got the call for a 1st Birthday Cake with a Dr. Seuss theme! I am going to break the construction down into steps. Maybe leaving out some things so if there are any questions at all feel free to ask! I have already attached the Dowel Rod to the board with a screw, placed the 8″ square Chocolate double layer cake on the board lowering it down onto the dowel rod first. (Be very careful to center it exact, you won’t be able to move it around once it is on the board and through the dowel rod.) The buttercream was then placed around the cake and down the sides to prepare it for the fondant. I rolled out an aqua blue marshmallow fondant that was made in advance. 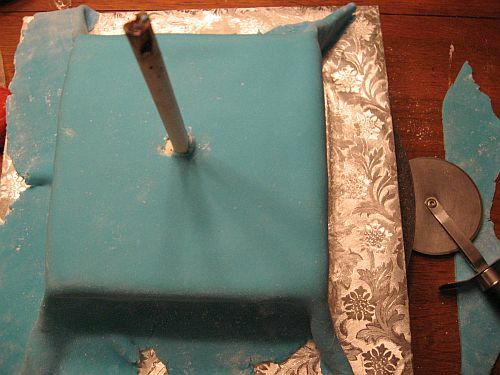 I centered it over the dowel rod, pushed it through the center and lowered it onto the cake. Next I took my Pampered Chef Pizza Cutter ( I love this thing, especially for cutting my fondant) and cut along the edge of the cake to remove the excess fondant. I did this to each side. In this step it is very important to get a nice clean cut that you use sharp scissors and cut very straight. I like to pinch the fondant as close to the cake as I can. Be careful not to pinch too far or icing will get between the layers causing your cut to ooze icing. 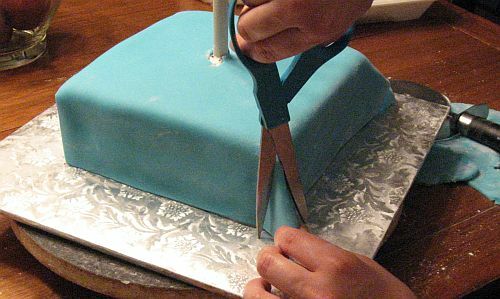 If this happens take a little water on your finger tip and run it down the cut to smooth the icing away and help seal the fondant. For this step I rolled out White Marshmallow Fondant that was made ahead of time. I used an 8″ circle board to cut out the white circle which will be the brim of my “Cat in The Hat” Hat! I centered it and slide it down the dowel rod, laying it flat on the cake. This next step is very impotant if skipped, you will crush the cake. You will need to insert 4 dowel rods around the center. 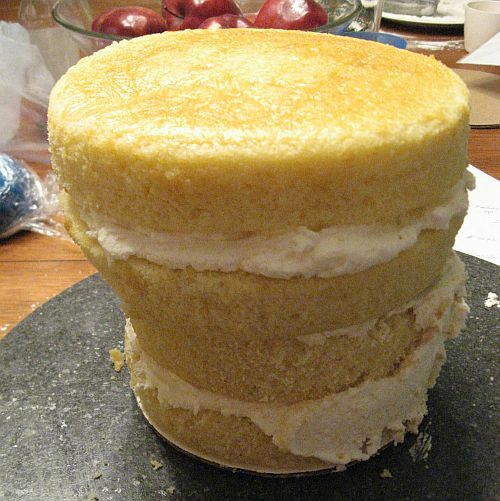 This gives the support to the top cake so it doesn’t crush your bottom cake. Ooozing Icing everywhere. 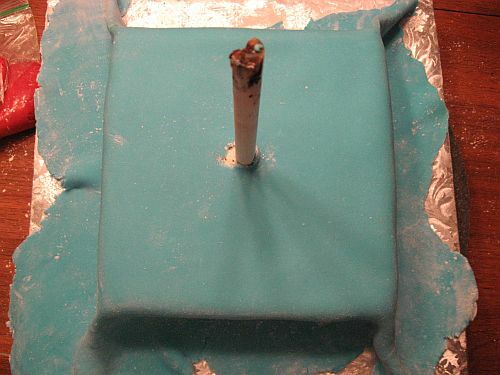 Place the dowel rods in 4 positions and make sure to cut them all even or one end of your cake will stick up higher than the others making it look like it is leaning. This step was the trickiest and took the most thought and planning for me. I cut the center out of two 6″ round boards, just big enough for the dowel rod to fit through. I took one round board and stacked my double layer 6″ yellow cakes with the icing already in the middle onto the dowel rod. 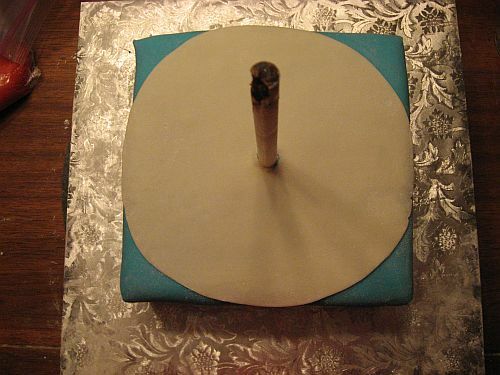 (this step was only to have the hole there) I then removed the cake and sat it on my turn table. I put a layer of icing down and placed the next board on top. I stuck the cake back on the dowel rod. I them placed a 7″ round cake slightly off centered so more of the cake was sticking off of the edge but flush with the cakes underneath on the opposite side. Iced the middle and stacked another 7″ round on top. 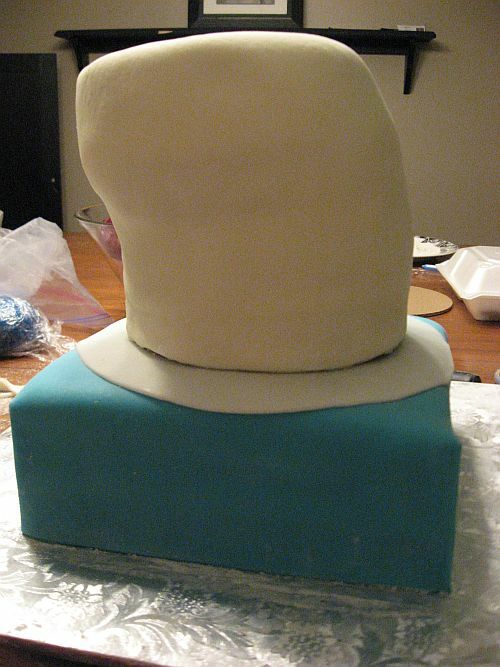 I removed the 4 stacked yellow cake rounds and placed them on the turntable, (You will then have to carve the cake for it to take the shape of the “Cat in the Hat” Hat) and iced the sides and top in preperation for the fondant! Roll out the white fondant and cover the cake. 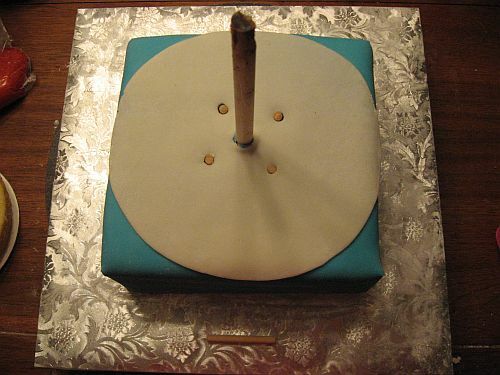 Put the cake onto the dowel rod so it is sitting on top of the square! Now it is time to decorate! I used Red fondant to accent the hat and an edible black marker to add the detail to the stripes on the hat. I free handed a One Fish on white fondant and then cut it out and stuck it on the side of the bottom tier. Rolled the lettering for “One Fish” because the little boy was turning one. Then cut out “Ben” for the top of the hat. The Cutest First Birthday Cake! Hope you enjoyed these instructions as much as we enjoyed making this Dr. Seuss Cake! Tulip 3 tier Square Wedding Cake York, PA! 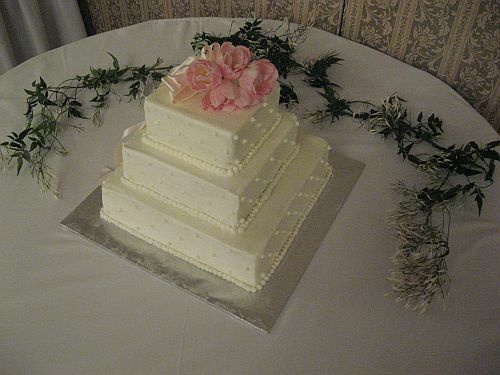 This beautiful 3 tier square wedding cake was made for yesterdays wedding reception held at the Holiday Inn in York, PA. 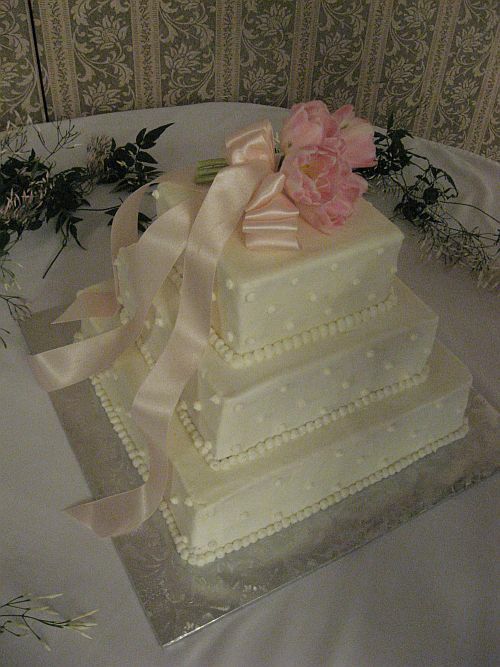 The three tier square wedding cake was decorated with pearl like accents going around the bottom of each tier and scattered around the sides of the tiers as well. The simple Buttercream icing was elegant and looked beautiful with the Pink Dynasty Tulips placed on top of the wedding cake by Fosters Flower Shop of York, PA! The Wedding Cake itself was a White Cake with a Black Raspberry Filling and topped with a creamy buttercream icing! A mouth watering combination! The Delivery went well, a little shifting of the second tier which happens. Luckily, or not so luckily, we forgot the touch up tools and ended up going back for them only to return and find the gorgeous flowers placed on top by Foster’s Flower Shop of York, PA! We touched up the pearls around the bottom of the middle tier and snapped a couple great pictures of the Wedding Cake and that ended our day! Pink Tulips on top of the White Wedding Cake for a York, PA Wedding!